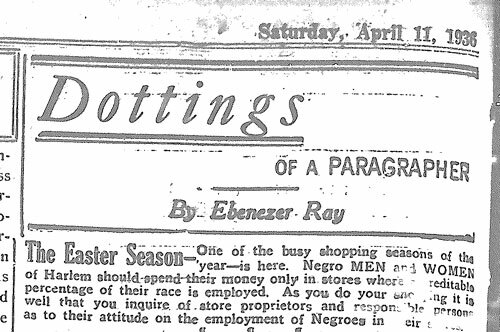 Ebenezer chided Blumstein’s Department Store, one of his frequent targets, for its announcement in the black press the year before that it had employed “60 Harlemites” on its staff. He argued that it would be hard to find 60 black employees in Blumstein’s with a microscope and that some of those department store workers may well have lived in Harlem, but they were not black. Jobs and economic parity for black Americans are on the wish list this Christmas season as well. The national unemployment rate has declined to 7.7 percent. The rate of black unemployment, while lower than it was, is 13 percent. With this in mind, black leaders met in Washington recently to set an agenda for keeping the black community from a steeper fiscal cliff. The meeting was convened by Marc H. Morial, President & CEO of the National Urban League, Rev. Al Sharpton, head of the National Action Network, Ben Jealous, President of the NAACP, and Melanie Campbell of the National Coalition on Black Civic Participation. The communiqué issued after the meeting outlined five key areas of focus. “We African American civil rights and social justice leaders come together on the heels of another historic election — one in which African Americans played a crucial and decisive role in securing a second term for the Obama Administration, and in the outcomes of numerous U.S. Senate, U.S. House, gubernatorial, state legislative, mayoral and other races across the nation. “We, the undersigned organizations are bound by our common goal to protect, promote and defend the rights, well-being and opportunity of 42 million African Americans. Just as my father wanted to ensure that neighborhood merchants did not take black Harlemites’ dollars for granted, black America expects that its considerable political clout be fully appreciated as well. During the 1936 Summer Olympic Games, James Cleveland “Jesse” Owens won four gold medals in Berlin: He came in first in the 100 meters, the 200 meters, the long jump and was part of the 4×100-meter relay team that also took gold. 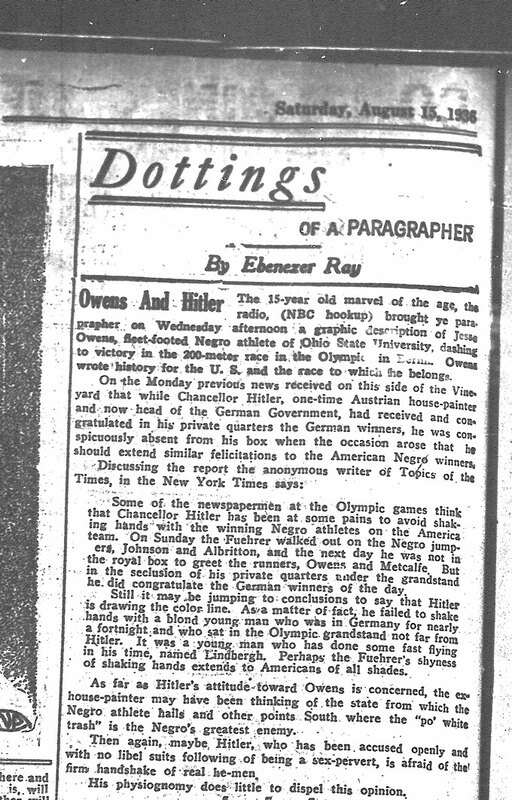 Owens’ success was a poke in the eye of Adolf Hitler, who had hoped the 1936 games would serve as a showcase his Aryan propaganda. My father’s Aug. 15 column was published the week my grandmother, Malvina Alkins, died. Guest columnists appear in the “Dottings” space in the two issues that followed. 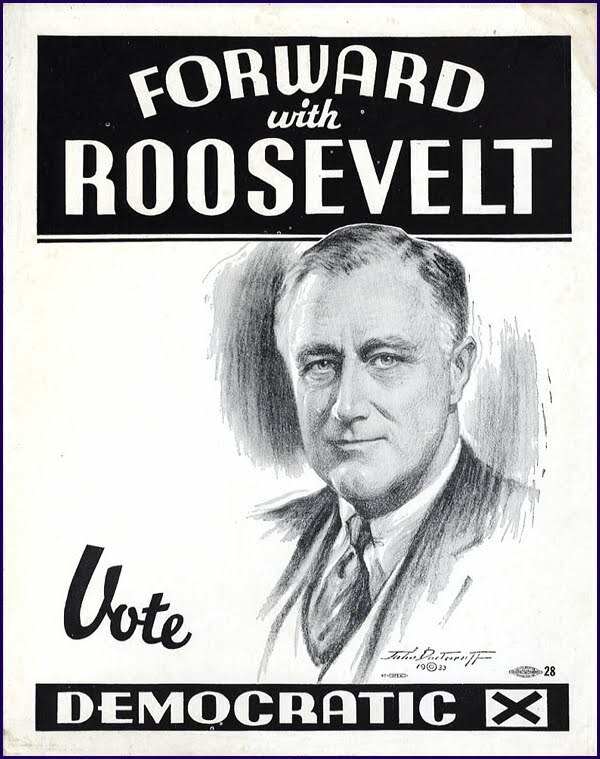 “To be considered worthy to take his place for even a week makes me feel that I have not labored in vain…,” he wrote in a guest column published Aug. 22, 1936. Today, athletes spanning the African diaspora are representing countries across the world, including Germany. Dearest Ellen-Marie, Where did 10 years go? Looking for a way to mark the 10-year anniversary of my eldest sister Ellen-Marie’s death, I looked to my father’s column’s for wisdom and inspiration. On a couple of occasions in honoring the dead, his inspiration came from Thanatopsis, said to be the most famous work of romantic poet William Cullen Bryant. It must have hit home for my father; he included the poem’s final stanza in a column he wrote after his mother died in 1936. He used it again several years later when honoring the death of a colleague’s mother. My reading of Thanatopsis is that Bryant’s point is that death and dying are part of life’s natural cycle, to which all of us will succumb. And when we do, we will join the company of the wise and the good. We should not fear death, but live life fully so that when our time comes we will enjoy our eternal rest. This is not really much consolation when you are in the throes of grief. When I got that 3 a.m. call on Sept. 25, 2001, that Ellen had died of a heart attack in her sleep, leaving two children and a whole host of other family members and friends, I spent the following days and months alternately wanting to die and fearing that I would. A decade does give you some perspective. And if tragedy teaches you anything, it is that you must put one foot in front of the other and press on, celebrating life’s abundance every day. Just returned from traveling and am still in the throes of the post-vacation dig out, so I’ll just let my father’s words speak for themselves. One item was written the week before Easter in 1936. Not sure what that last word is, but you’ll get his point. Don’t shop where they won’t hire you. 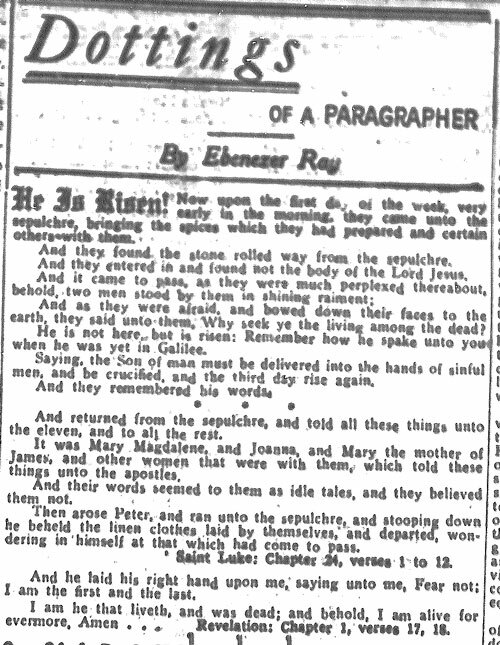 The second item was published a week later, the day before Easter Sunday, which fell on April 19 in 1936. 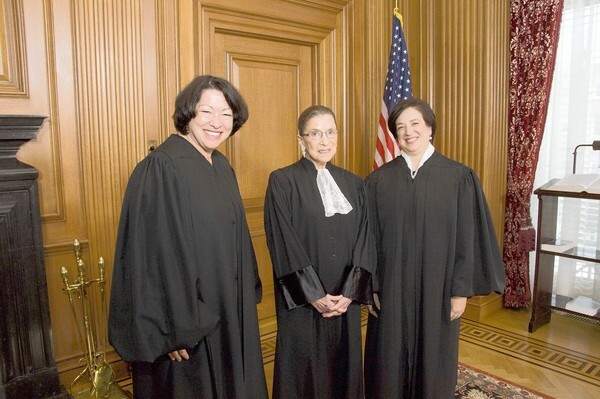 Last week, a majority in the U. S. Supreme Court rubbed salt in a decades-old wound. It denied John Thompson, a man who spent 18 years in prison – 14 on death row – for crimes he did not commit, $14 million in damages awarded him after he was exonerated. Thompson’s case sounds like something that took place in the 1920’s and 30’s, not the 1990s. In 1984, Thompson was arrested in the murder of a man from a prominent New Orleans family. According to NPR, another man, Kevin Freeman, also was arrested for the murder, but he made a plea deal in exchange for testimony that he saw Thompson commit the crime. Prosecutors in the Orleans Parish District Attorney’s Office, then run by Harry Connick Sr. (Yes, the singer’s dad) needed more ammunition to seek the death penalty against Thompson, who had no violent felonies on his record. So they trumped up a carjacking charge against him and railroaded that case through. Once Thompson had a violent felony on his record, the carjacking conviction, prosecutors were able to convict him of the murder and send him to death row. A team of lawyers from the law firm Morgan Lewis, took on his case. They thought they had exhausted every one of his appeals. (A date for Thompson’s execution was set seven times.) He was just weeks away from execution when a legal team investigator found evidence (on microfiche!) that ultimately resulted in Thompson’s exoneration, not only for the murder but in the carjacking case as well. Once exonerated, Thompson sued the district attorney’s office arguing that it was liable for failing to properly train its employees on the requirements of Brady. A jury awarded him $14 million, which was upheld by federal district and appeals courts. Connick, Sr. was among the petitioners who challenged the lower court rulings in the Supreme Court. In writing the majority opinion, Justice Clarence Thomas acknowledged that prosecutors have an obligation to see that justice is done, and agreed that in the case of John Thompson they fell short. However, Thomas, who once portrayed himself as a victim of high-tech lynching, said prosecutors should not be held responsible for training – and thus the corrupt conduct – of the attorneys under their authority. Thompson is coming out the better man in all of this. He says what bothers him most is that the Supreme Court decision opens the door for district attorneys to turn a blind eye to misconduct on their staffs. “My life was spared despite the efforts of many prosecutors from Harry Connick’s office who sought my conviction and execution over 18 years. They’re the criminals they made people believe I was,” Thompson told the Associated Press. 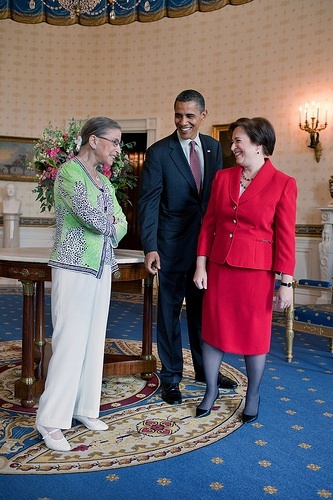 Justices Ruth Bader Ginsburg, left, and Elena Kagan with President Obama. What would my father have made of this photo? “From the top down, the evidence showed, members of the District Attorney’s Office, including the District Attorney himself, misperceived Brady‘s compass and therefore inadequately attended to their disclosure obligations. Throughout the pretrial and trial proceedings against Thompson, the team of four engaged in prosecuting him for armed robbery and murder hid from the defense and the court exculpatory information Thompson requested and had a constitutional right to receive. The prosecutors did so despite multiple opportunities, spanning nearly two decades, to set the record straight. Based on the prosecutors’ conduct relating to Thompson’s trials, a fact trier could reasonably conclude that inattention to Brady was standard operating procedure at the District Attorney’s Office. “Women’s fight for equal suffrage was a desperate and historical one. She won it,” he wrote. He credited Jane Todd, a Westchester County assemblywoman, with securing passage of a bill in the state assembly that would enable women to serve on juries in New York state. 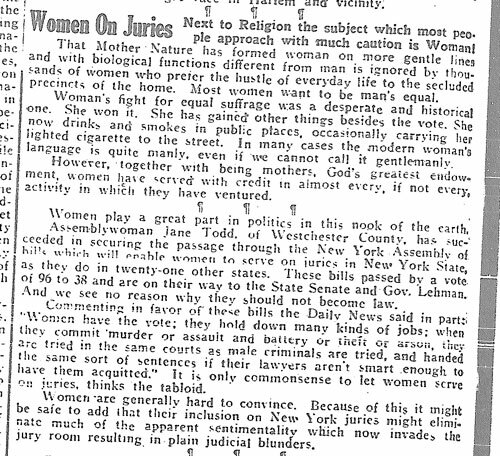 “Negroes are not barred from jury duty in New York, yet there is almost total absence of men of color in jury panels. Should Assemblywoman Todd’s bills become law colored women might exhibit a different tendency. We could well appreciate a few colored faces in the present all-white atmosphere of the criminal courts jury box,” Ebenezer wrote. Unfortunately, having “a few colored” faces in the jury box or even on the highest court of the land guarantees nothing. 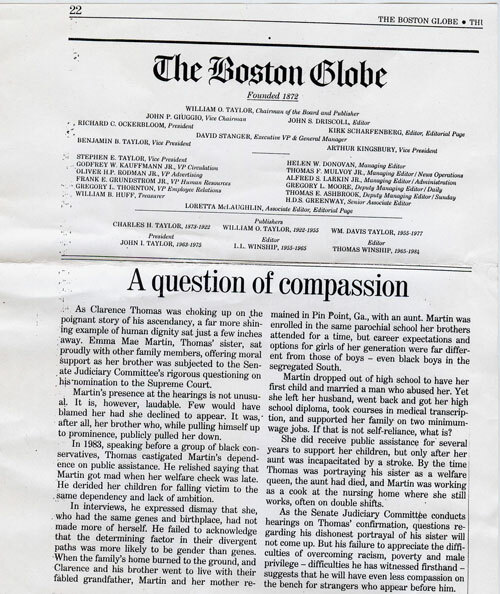 In 1991, after Thomas was nominated to the Supreme Court, I wrote an editorial for the Boston Globe titled “A question of compassion.” I had written extensively about the sexual harassment charges made by Anita Hill, however, this editorial was about how he had publicly and dishonestly, castigated his own sister and her children for their “dependence” on public assistance. Almost 20 years later, Connick v. Thompson stands as a reminder that Justice Thomas has not changed.